PESHAWAR: The death toll from a double suicide bombing on a church in Peshawar rose to 81 Monday, as Christians protested across the country to demand better protection for their community. The attack on All Saints church in the provincial capital of northwestern Khyber Pakhtunkhwa after a service on Sunday is believed to be the deadliest ever to target the country’s small Christian minority. Doctor Arshad Javed of the city's main Lady Reading hospital told AFP the death toll had risen to 81 overnight, including 37 women. A total of 131 people were wounded. Meanwhile, a four-member committee which was formed to collect evidence from eye-witnesses has already started visiting the families of the victims. Reports said two suicide bombers carrying hand-grenades and pistols entered the church and targeted the worshippers. Their ages were reported to be between 20 to 22. Christians demonstrated in cities around Pakistan to protest against the violence and demand better protection from the authorities. Prime Minister Nawaz Sharif strongly condemned the “cruel” attack, saying it violated the tenets of Islam. Pope Francis also spoke out against the violence, calling it “a bad choice of hatred and war”, while Pakistan’s Ulema Council, an association of leading Muslim scholars, branded the attack “shameful”. The 400 or so worshippers were exchanging greetings after the service when the bombers struck, littering the church with blood, body parts and pages from the Bible. The walls were pockmarked with ball bearings that had been packed into the bombs to cause maximum carnage in the busy church. There were conflicting reports over which militant organisation carried out the attack. According to foreign news agencies, a wing of the Pakistani Taliban claimed responsibility for the attack, saying it would continue to target non-Muslims until the United States stopped drone attacks in the tribal region. AFP reported that the Tehrik-i-Taliban Pakistan (TTP) had set up a new faction, called the Junood ul-Hifsa, to kill foreigners to avenge US drone strikes on Taliban and Al Qaeda operatives. “We carried out the suicide bombings at Peshawar church and will continue to strike foreigners and non-Muslims until drone attacks stop,” Ahmad Marwat, a spokesman for the group, told AFP by telephone. Provincial lawmaker Ghauri said there were about 200,000 Christians in Khyber Pakhtunkhwa province, of whom 70,000 lived in Peshawar. Only around two per cent of Pakistan’s 180 million population is Christian. The community complains of growing discrimination. In the town of Gojra in Punjab province in 2009, a mob burned 77 houses and killed seven people after rumours that a copy of the holy Quran had been desecrated during a Christian marriage ceremony. Rimsha Masih, a Christian girl who was arrested for alleged blasphemy last year, fled to Canada with her family in June after the charges were dropped. What else to expect from a country born out of inferiority complex?. Its better all minorities leave pakistan so that in case of a future war, it is easy to annihilate the entire pakistan without any guilt. The photograph say Pakistani christian man. The whole article describes pakistani citizens as christians, which is absolutely wrong. The edit should say, innocent pakistani murdered by fanatics. Religion has creeped inside Pakistan and its citizens, and is bigger than the state and its citizens. Now this is something very funny. 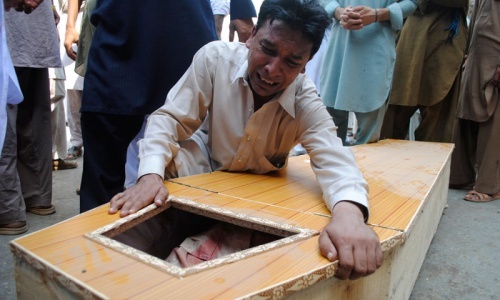 More than 100 people die in Karachi everyday and they belongs to all ethnic groups. But we never seen a country wide protest from anywhere in Pakistan. But if Shia dies or Christians dies it becomes so important to have nation wide protest. Why there was no nationwide protest and strikes when people in Baluchistan were brutally killed by Americans and Pak Arm forces. This and attack against shias by taliban elements prove that they have no respect for real peaceful teachings of Islam. They are bent on destroying islamic traditions and Pakistan state is a mute spectator to all this, govt is more interested in trying to talk to talibans with a hope that they shall modify their policies and reduce such attacks on minorities and shias. How much talibans shall co-operate, allah only knows. The minority is insecure everywhere in Pakistan, not only at Church, Tample or Masjid. Shame for all those Animals behind this activity ... May ALLAH show them right path ... They dont belong to anyone, anywhere, any religion ... Just Animals !!! Not even a single word of protest from our Muslim Brothers !!!!! Christian community has huge contributions in the fields like education/medical in Pakistan. Taliban are the real enemy and we should do whatever it takes to get rid of them. Pakistani Christians are the most peaceful of all communities in Pakistan. I feel so asahamed that we cannot protect them. Needless to mention, if not more, death toll of muslims is much more than any other community in Pak. It is hurting. Pakistan is slipping into Chaos. Balochistan bleeding, Karachi bleeding, KPK bleeding. every one is leading a fearful life. Is there some one who could save people of Pakistan????? RIP. Except this there is nothing to say. Yet another atrocity against helpless, unarmed Christians in the name of Islam. I feel ashamed to be a Pakistani when the state cannot protect the most vulnerable section of our society. This incident will surely draw more criticism of Islam and Muslims from the world over. Islam preaches peace but these goons have high-jacked the religion for their own sake and they are surely a disgrace to Islam and Muslim. I cannot understand why cannot our Army just eradicate these terrorists that we are harboring for years now. They are a menace for all Pakistani citizens. I strongly recommend that our Govt with the support from Army and intelligence agencies wage a war on these terrorists to earn some respect amongst the league of civlised nations. The Muslim World is going through the worst phase of its history. Thanks to Islamic / Jihadist terrorism carried out in the name of Islam - the religion of peace! @Ravi: Politician and terrorists are supporting each other that's why our politicians have no courage to condemn these heinous crimes against humanity. Real question I want muslims to ask themselves is: Are non muslims considered as enemy of islam? Yes or No. If yes, then you should not condemn this act and bravely follow a violent, intolerant religion. If No, then condemn this act and show bravery in raising your voice against such acts. @jamki: Yourselves? No one in interested in getting caught in a mess! This is a plan to undermine the KP Government of Imran Khan. It disgusts me to my bare bone, how can people kill in the name of religion. It is indeed the madness not a mission, taking elements of the Holy Scriptures out of contest. We are the creations of God, we are also obliged to realize and remember that every one else is also the creation of same divine creator. This heinous act of extremism is not only maligning the religion but the divinity of the creator as well. Remember when ever there is an incident like this, the first question people inevitably ask, why did not God do some thing? Where was God when all those people died? We beg the extremist for God sake, give up the notion that you are right, be compassionate, give up your egotism, because you extremist religion will not endorse your ego or your identity. Folks we should be looking for suggestion on what we can do about this extremism within our own society, they just cannot be ignored. As a Muslim my head is bowed in shame. I condemn this brutal act of hatred and terror in the strongest possible terms. You must be feeling very proud, right? Killing, maiming, terrorizing a helpless and powerless group of people. Shame on you. I know you are not reading DAWN, I know you are not READING. @Muhammad Ahsan Khan: Do you think the majority is secure? How many Muslims are killed everyday by the same bunch of criminals? No wonders to describe! These pathetic crimes continue to incur and all the leaders could do, is to say, notice have been taken. My heart goes to the victims family. May God give you patience and courage in this difficult time. @Ravi: Some wise words there. Why the Government wants to deal with these cowards who go after unarmed and peaceful people?? If we accept their terms and conditions to them we will appear coward and helpless. Does the Government wants the situation to really get out of control? Ashamed to call myself a Muslim! Has Imran Khan learnt a lesson from this? @sheikh: "believe me its not one of us". You are so sure! I think I know the reason for that absolute certainty in your statement. @J Khan: You are absolutely right. No one is safe from these fundamentalists, not even the ordinary, innocent Muslims. These terrorist are killing innocent people either Muslims or christian or any other religion when bomb blast any part of Pakistan. This is not good and should take action against them. @sheikh: Mr Sheikh than who is the culprit explain please. Sir, think and think deeply. Do nto go to US or taliban but think and explain it right. This not what Islam is about, govt should not talk with Taliban or any other terrorist group. An effective operation under the guidance of army should be carried out like that what has been done in SiriLanka against tamil fighters. I highly condemn this cowardly attack against the innocents. @Ravi: Ravi i agree with your statement, but i do nto agree with your statement. When incident happen in US or britain, they do not call it a US citizen or Brotain Citizen, they call it Muslim US Citizen or worse is Muslim Paksitani (or indian) US Citizen. Yes it toally condemn what happen and we should call them as Paksitani citizen but that is nto the reality in this world. These brutes falsely claim to be the true muslim flag bearers. SO give them the Islamic punishment for murder and hang them all. Increase drone strikes in their areas to non-stop so they continue to bury their dead and do not have time for such atrocities. May curse of God fall upon them. Who sent and sponsored these disgruntled suicide bombers doomed to go in burning inferno of hell perpetually! Burning in their own of fire of hatred against anybody reeking under dark ages like traditions and tribal systems with no love, respect and tolerance for anybody, they have brought hell on PK and Pakhtoon nation who is bleeding in final analysis. This is not the only incident in isolation. Several other incidents of blasting schools, colleges, hospitals, thinkers, intellectuals, professionals, government functionaries and establishments, facilities and public welfare places, places of their own worships like mosques and imambargahs, which has been spared by these beasts living in human doing savage acts. It is a shame on Humanity. The custodians of Islam in Pakistan must protect all its people irrespective of their religious belief. Let peace come to Pakistan else it will be in pieces. We heard yesterday about the tragedy in Nairobi and it has been reported (not confirmed) that 3 British nationals are among the dead. The Prime Minister of Great Britain cut short his meeting with the Queen and returned to his office. Called a meeting of the cabinet to review the situation in Kenya. Pakistani Prime Minister, on the other hand, couldn't cancel his trip to New York while in his country a place of worship was bombed and killed 80 people. Clearly shows how leaders of the civilised world handle the situation. Nawaz Sharif, I hope to God we don't have to go through 5 years of your government. Do we still need to talk to the terrorists if yes they first have to act like humans and also needed to be disarmed if not just crush them to fullest extent of the state power. I am ashamed to be a Pakistani and certainly ashamed to be a Muslim. 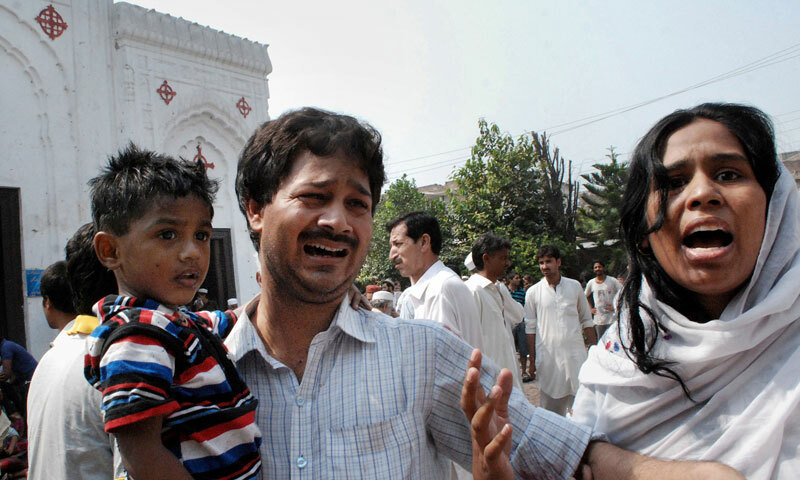 My thoughts and prayers are with my Pakistani Christian brothers and sisters. @J Khan: Even mentioning what is happening to majority is insensitive and shows your ignorance. As long as we have people like you in Pakistan, God help the minorities. Shame on you. Not sure what world you live in. Do you have no shame? Like millions of Muslims and Pakistanis my heart bleeds on the gruesome carnage of our beloved fellow Christians at the devilish hands of the enemies of Islam, Pakistan, peace and humanity. Quran and Islam says in Soorah 5/32 that to kill a single innocent human is like killing entire mankind in the eyes of God. These terrorists have killed many times more Muslims in Pakistan than non-Muslims hence there claim to kill non-Muslims as revenge of drone attacks is frivolous. How can they make the innocent and peace loving Christians and other non-Muslims living in Pakistan responsible for drone attacks who have protested several times as a community against the same. These gruesome terrorists and murderers of humanity should realize the facts that it is the Christian World from America, Canada, Europe to Australia who have welcomed Muslims from all parts of the world with open arms and given them equal opportunities and security? @J Khan: Yes, you are 100% correct. My deepest condolences for the victims' families. TTP and its faction Junood ul-Hifsa are the biggest enemies of Islam and they should dealt harshly. Government should cancel any and all negotiations with TTP. TTP are deceiving Pakistan and don't want any peace. They should pay for their terrorist crimes and acts. I wish those criminals were killed instead of innocents. @A Shah: Don't accept blame for the actions of terrorists'. A true Muslim would never commit such atrocities. @Ravi: The reason for the choice of words goes back to the roots of existence of Pakistan. It was formed as an Islamic Republic. "Secularism" is a foreign concept here. Very Very Sad - All of this in the name of Islam??? It is time that the internal security people ensured that Friday sermons teach maximum tolerance & love of all humanity, whatever their race, colour, creed or beliefs. Teaching of tribalism and hatred in these sermons should be banned. They should teach love of humans and kindness towards animals, and also teach forgiveness. Look at what the army is doing in Egypt. @jamki:Yes PM will build a bullet train. This will solve all your problems. The Peshawar gory incident of Sunday has once again proved that the State has failed in its basic responsibility to provide security to its citizens. Change of Inspector General of Police KPK is merely an eye wash, more drastic approach is called for. There is urgent need to review the working of public institutions and organizations responsible for the security and safety of life and property of the people. A National Commission under Dr. Shoaib Suddle may be constituted to examine and study the working of concerned institutions. The National Counter Terrorism Authority has been established to eliminate the menace of terrorism and extremism.but unfortunately the previous government did not appoint its head, and it continues to function without a regular National Coordinator. It is not understandable how ad hoc measures can effectively deal with challenges involving national security. According to Section 3(2) of NACTA Act, the Authority functions directly under the Prime Minister, who is the Chairman of Board of Governors. Can we cut this nonsense of "terrorists have no religion", when all the killings by these terrorists is being done in the name of religion. @Ravi: But my question is different . Why in most of the cases Muslims are associated with terrorism ? 85 innocents were butchered in a single incident . Al-Qaeda terrorists in Nairobi killed 68 innocents . As per reports they selectively killed non-Muslims . Why this society lacks tolerance and so impatient to criticism ? Does their religion teach to kill non-Muslims ? This is not the case of a single or two Islamic countries , this is the case of all most all Islamic countries and societies .Islamic terrorists are asking for a independent state in Philippines and have taken the whole city as hostage .Be it Asia or Africa or even Europe , all are facing the hatred of this religion . How long shall we face the burnt of this religion ? This is not the Pakistan Jinnah wanted. I have read in many books that he wanted peace among all religions. He had promised a land for all religions when Pakistan was created. But he died soon and a bunch of landlords & dictators interpreted the incorrect version of Islam & as a result fanatics are now roaming Pakistan on a killing spree. @J Khan: Agree with you, Muslim ulemas must stand firm against terrorist & tell public true spirituality.blasting killing is childens is not islaam. Islaam is towheed zikr ta alluk ma allah wa rasool. I wonder islamic world is burning but ulemaas are sleeping. @jamki: Sombody wake up millions of sleeping ulemas.there job is not only recieving chanda(donation),but also unite awaam & educate them against these terrorist who are defaming islaam. This kind of killing, murder and mayhem is not allowed in Islam. No one kills innocent, unarmed harmless women, children and men. These criminals and people who encourage such criminals should be killed for spreading terror among innocent civilians. Has the Pak government and Imran Khan got the guts to do it. The Frankenstein monster which Zia ul Haq created is haunting the Pakistani Society today. The government is a afraid to take decision to give the army their support to destroy Taliban. Because if they do, then it is taking the same decision that Musharaf took against Taliban and they condemn him. Caught between a rock and hard place. I am overwhelmed by grief. What kind of person will order such act and the people who carried out the mission can not be human. These are my people and also the sons and daughters of Pakistan. I urge Pakistanis to do every thing to minimize their loss. Most of the muslims are violent people. Sorry if i hurt anyone. They are never taught to tolerate other views. No wonder, very few poets , musicians and learned men were born among muslims. Muslims are the least creative people on earth. When it comes to destruction, killing and mayhem, Muslims are the leaders. problem here is that we are not seeing any result to curb them or any action take in last 5 years.It will be same in next 5 years. Please do some thing as we are feed up with this and with you politicians. My heart goes out to the people affected. May the dead rest in peace and may the survivors get all the comfort , support and hope they can get. As a Muslim, I am embarrassed in front of my Christian brothers, people who are Ahle-e-Kitab. I I can not understand what pleasure these extremist get by causing so much of pain and suffering on the innocent church attendees after a Sunday morning service. When are we going to say "Enough is Enough, this insanity must stop"? This is what every one is saying after each and every bombing. There have been hundreds of bombings killing thousands of innocent people in pakistan yet not a single terrorist has been brought to justice. This is a time-tested established truth in pakistan. You guys will forget everything after some time or till the next incident. The pains of the victims will rest with them till the end of their life. There is no one to turn to for solace. Only two types of people are in pakistan one is a terrorist and the other is a supporter of terrorist. Pakistanis are best people to kill Pakistan. Good bless who lost their lives and the familes lived to bare the losses. The nation who cant protect its own citizen must have lost its soul. This is a daily routine aganist shia ahmadis christian hindus etc. Feel sorry for jinah he must be tossing in his grave. @Khalid: you are crazed or out of mind plz control your emotions . Islam is the religion of peace islam doesnt say to its followers to go and blast your precious bodies in a church. then why blame islam ? @tasal: but it is happening ...!